Press Release – San Pedro Sailing Club – August 8, 2011 - On Sunday, August 8th, nine young sailors signed up to race in San Pedro’s Youth Summer Sailing Regatta. The regattas are held by the San Pedro Sailing Club. They start on the beach at Caribbean Villas, who is one of the sponsors of the four sponsors of the Optimist class dinghies. The gracious sponsors of the other three Optimists are, Milo Paz, The Symes family’s weather station, and Scott and Jody Harnish’s Palapa Bar. Since there are still more eager young sailors than there are dinghies for them to sail, three preliminary races were held to determine who would race in the final. In the first race, there were several lead changes as David Verralls, 13, of San Pedro High dueled Alexander Rhaburn, 11, of Holy Cross. Behind the leaders, Kevin Velasquez, 9, of Holy Cross and Jerdon Anderson, 12, of RC School also changed places several times in a duel for third. On the final lap, David employed a daring zigzag tactic, only to have it fail. Alexander overtook him at the windward buoy and just managed to hold on for the win. Jerdon prevailed over Kevin in the tight race for third. The second race pitted Mitch Sersland, 9, of Isla Bonita against Island Academy schoolmates Faith Peterson, 10, and Lily Hayden, 11. Mitch jumped into the lead at the start and never looked back. After several attempts by Faith to overtake him, Mitch improved the distance between himself and the boats, maintained concentration, and sailed to an impressive victory. In late laps that became quite exciting, Lily closed distance between herself and Faith to challenge for second. Around the windward buoy and bound for the finish, both skippers experienced control issues that sent their boats crazily off course and into 360 degree spins. 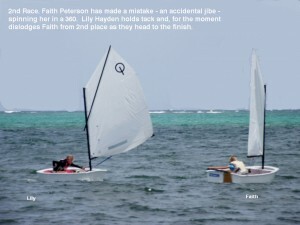 While both skippers laughed and shrieked, Lily managed to surge out of the chaos and zip ahead of Faith. 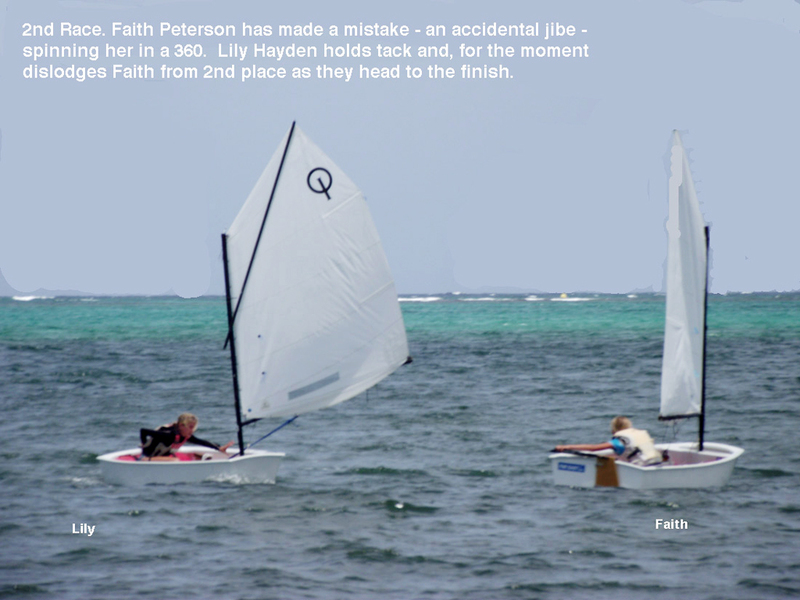 Yet at the very last moment, Faith took a better line and just barely reclaimed second as the boats crossed the finish. Neideline Meza, 8, of Holy Cross raced against Junior Amahio, 11, of the RC School in the third race. Both skippers encountered problems changing course into the wind. Race and Safety Officer Paul McCarthy went to their assistance in his skiff. The three decided it would be better and more fun if they just practiced. Junior was happy just to do his own thing while Neideline enlisted Paul to coach her around the rest of the course. Both young skippers came ashore with big grins and the extra experience and confidence needed to eliminate the difficulties they had experienced. The first and second place skippers from the first two races competed in the final race. Mitch Sersland, 9, shadowed closely by Faith Peterson, 10, jumped out to a surprisingly lengthy lead, which they held for almost 4 laps. Behind them, David Verralls, 13, and Alexander Rhaburn, 11 found themselves dueling once again as they tried to out sail each other and gain on the leaders as well. Their opportunity came when Mitch found trouble and stalled while changing course into the wind at the windward mark. Faith, who had stayed close by, following Mitch’s every move, made the same mistake, and she too went into irons. 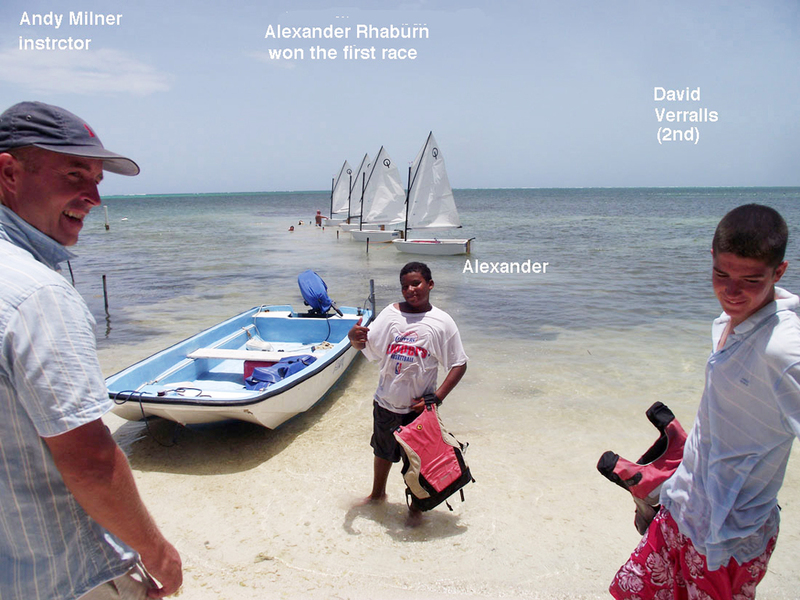 Alexander and David overtook them both. Now their duel would decide the regatta’s overall winner. Alexander fought off David’s challenges again and again. Both were hotly pursued around the final windward buoy by Faith in third and Mitch in fourth. It was a tight pack heading to the finish. With only fifty or so yards to go, a gust caught David’s sail and carried his Optimist past Alexander’s and across the line for the hotly contested victory. Mitch and Faith took third and fourth respectively. Sailing lessons and the opportunity to try racing are free. To find out how to participate, call Paul McCarthy, the San Pedro Sailing Club Training and Equipment Officer at 610-0773 or stop by his place of business - Sailsports Belize on the Beach at Caribbean Villas. The club is an affiliate of the Belize Sailing Association, a national NPO. These Sunday youth regattas owe profuse thanks to Paul McCarthy for deftly and tirelessly monitoring the exciting “LeMans starts” and then the safety under sail of all the young skippers. Regattas like this are as entertaining to watch as they are to sail. All spectators are welcome. Food and refreshments are available, and the races provide onlookers with highly colorful and sometimes dramatic entertainment in a setting that is no less than stunning. Many photos of this day’s event are posted on the San Pedro Sailing Club’s Facebook community page, for friends and family and anyone else interested to go to and enjoy. In other news, The Belize Sailing Association has approved The San Pedro Sailing Club’s proposal to hold the 2011 National Belize Optimist Regatta here in San Pedro.